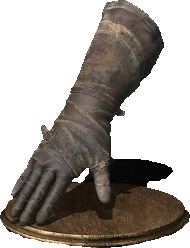 Assassin Gloves are Gauntlets in Dark Souls 3. It is part of the Assassin Set. Soft leather gloves worn by assassins who lurk in the shadows. The thick leather offers reasonable absorption without creating any undesired noise. A well-crafted piece of protection.